* Works on both 3650 and TR6060 Transmissions RAM hydraulic release bearings are designed for stock applications, kit car build ups, or circle track. The bearing is a floating design and installation is simple and quick. Optimal uses for this bearing are circle track cars utilizing stock style clutches, or any project car in which fitting mechanical linkage is not possible. The bearing requires a minimum 3/4'' or larger bore master cylinder and a -3AN feed line to run from the master to the bearing. 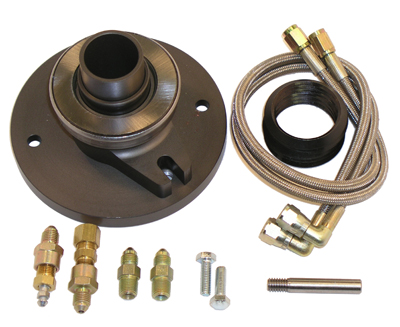 A remote bleeder kit is available to make bleeding simple from outside the bellhousing. All parts necessary for rebuild are available from RAM. Our Quality & Finish will leave you with a grin from ear to ear as it is the Best looking unit available for your Ford Mustang or Cobra. Quality Construction: No one else gives you the bold clean styling of our Aftermarket Dress Ups, Suspension and Performance Parts for your American Muscle Car like UPR Products! Click Here for Instructions Click Here for Factory Bearing Diagram Fits these Vehicles: 2005 2006 2007 2008 2009 V8 GT 4.6L 5.4L GT500 Shelby Bullitt Mustang Roush & Saleen Vehicles. Made in the USA!